"Rocket Science," written by Andrew Radner and illustrated by Galen Frazer, talks about exploring planets across the solar system. Here, a rover on Mars (presumably the Curiosity rover) lasers a target on the surface. As I read the beautifully illustrated "Rocket Science" by aerospace engineer Andrew Rader and illustrator Galen Frazer, I couldn't help thinking how much our understanding of space has changed since I was a kid about 30 years ago. Back then, the Voyager spacecraft hadn't finished their journey through the solar system. We hadn't found evidence of ancient water on Mars. Heck, scientists hadn't even confirmed the existence of exoplanets way back then. Today, there are more than 3,000 confirmed planets outside of our solar system, and many more probable ones. But overall, "Rocket Science" — which recently wrapped up a successful Kickstarter campaign with $54,692 pledged of their $15,000 goal — does a beautiful job of getting around that problem. The book is aimed at children and preteens ages 6-10 who have a basic understanding of space, and want to learn more about the solar system and the rockets that get us there. The authors lay out space facts that likely won't be overturned quickly. This includes basics about the solar system (including additional detail about some of the planets), how rockets work, how ion engines and solar sails work, and even a little bit about extrasolar planets and extraterrestrial life. 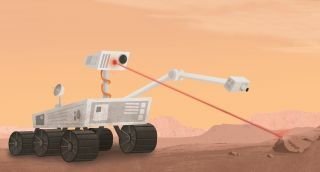 Only some robotic missions mentioned are still in progress (Juno, which is orbiting Jupiter; New Horizons, on its way past Pluto; Dawn, at the dwarf planet Ceres), although one of the illustrations appears to show the Mars Curiosity rover shooting a laser at a rock. The book "Rocket Science" also includes some up-to-date information on rocket technology, such as this self-landing rocket arriving on a drone. I enjoyed the word pictures that help children think things through. The Saturn V rockets that brought Apollo astronauts to the moon are compared to skyscrapers, and the authors playfully point out why only half of the 50-some robotic missions to Mars made it there safely — "Getting to Mars is hard!" My favorite segment was a description of how an orbit works, although the book could have used more illustrations to make the point: "Even in space, gravity pulls spacecraft down toward Earth, just like it pulls you and other objects toward the ground. But if a spacecraft is moving very, very fast, by the time it would normally hit the ground, the ground is no longer there. This type of curved path is called an 'orbit.'" An illustration from "Rocket Science" shows how planets' distance from their star is critical to determining whether they could be friendly to life. The illustrations in the book are also beautifully done. In some cases (but not all) the text carefully specifies if a drawing is to scale. One picture shows Voyager 2's incredible path from Earth, past all the gas giant planets, and to the edge of the solar system. Another shows a set of telescopes presumably searching for radio signals from intelligent life, all pointing underneath a starry sky lit only by the moon. A cutaway drawing of rocket staging was spectacular, too. But the authors missed an opportunity with their International Space Station drawing. Instead of showing the entire station or doing another cutaway, you only see a part of it; the picture focuses on a SpaceX Dragon spacecraft berthing with the orbiting complex. Overall, the book is a good buy for young readers who are interested in space, although I suspect they will quickly turn from the printed page to look up more about these missions on the internet. And why not? Seeking out new information is what rocket scientists should do. It's great to have a kid's book encouraging that.